My daughter told me a horror story while we were on vacation this summer. No, it wasn’t about creepy zombies told around the campfire while she shined a flashlight up her chin. Worse. It was about her roommate’s Taylor guitar whose neck was broken during an airline flight. If you are familiar with the YouTube videos, “United Breaks Guitars”, then, yes the airline was United. But the scariest thing: this could happen to you anywhere – even at home with your guitar snug in its factory hard shell case. Here’s some things you can do to prevent a broken head stock or neck when traveling, shipping your guitar or even at home. Do you need to travel with your expensive Gibson/Taylor/Martin or whatever guitar? I discussed vacation guitars in a previous post. Vacation guitars are essentially guitars that travel well. If you’re a gigging musician, then you may need to bring some decent quality guitars to each performance. However, even then, if you have really valuable guitars you might want to keep them for composing or recording. The rest of us amateur guitarists might just pick something compact or rugged or both for our travels. The only guitar I’ve flown with is my Traveler Escape. I can carry it on and place it in the overhead luggage bin. It has no angled headstock to break off (headless). I don’t worry about the Escape breaking when I fly with it. TSA agreements allow you to carry a guitar onto a plane. That’s right, you are allowed to carry musical instruments into the aircraft cabin, in addition to the normal allowance of one bag and one personal item. This was negotiated between the American Federation of Musicians and TSA in 2002. However, there could be a few problems. First, you may have to prove this was allowed. Download the pdf spelling this out and carry it with you. Also, the TSA website indicates there is some discretion allowed on the airlines part. So the 2002 agreement may not be the final word. FYI – Here’s the United Airlines policy. If you get through security with your guitar there could still be a problem on the plane. Because there is now a charge for checked luggage on most flights, the cabin storage areas are more crowded than ever. Thus, technically being allowed to bring your guitar onboard won’t mean much if there is no room and the cabin crew decides the excess luggage will be gate checked. Even if you plan on bringing your guitar into the cabin, read the next section regarding how to pack it. Packing you guitar for baggage handlers. Before discussing how to pack your guitar you should know why and where your guitar is most likely to break. Most guitar breaks involve the head and are either at the nut or on the neck near the nut. The head is attached at an angle to the neck. The tuning machines hold the strings and the angle keeps pressure on the nut. The tuning machines are metal and add extra mass to the head. Now if your guitar and case fall either forward or backwards where the neck is supported but the head has room to move, there can be enough force to snap the head/neck. This has been called the whiplash effect. The extra mass of the tuning machines make this more likely. The key to preventing the whiplash effect is to pack your guitar in the case so that the head can’t move. The easiest way to do this is to tightly stuff crumpled newspapers beneath and above the head. How much newspaper? It should be enough so that it is difficult to close the case lid. Before you close the case, most authorities recommend you loosen the strings before you fly. Extra tension may just be enough to snap the neck in fall. Stuff newspaper in case above and below head – red and yellow areas shows area to be protected. If you are traveling with a steel string flattop guitar, you can now close the case and move on. But if you have an electric guitar or perhaps an instrument with a floating bridge, you should remove or secure anything that could become loosened and fall off during the trip. Examples of things that might loosen due to vibrations during flight are volume and tone controls, batteries for acoustic-electric guitars and archtop pick guards. Also don’t put anything that could damage your guitar in the accessory compartment. Newspapers in case – use more than I’ve shown. You have now completed phase one of your guitar protection plan. Many will stop here. But if you’ve ever purchased a guitar and had it shipped to you, or if you’ve ever shipped a guitar, you probably know that guitars are usually shipped double boxed – or at least shipped with the case (packed as above) inside another box for extra protection. Guitar cases are not shaped to be safely stored so they won’t tip over. Rectangular boxes are a better shape for this. 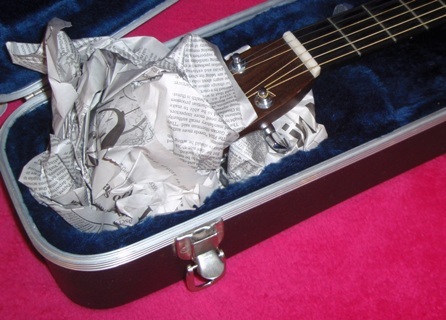 Packing your case inside a cardboard box with crumbled newspaper all around, but particularly in the corners, will help protect your case and instrument from drops. Use outer box, duct tape or case cover to protect latches, handle and hinges. I highly recommend the Frets.com article on traveling and shipping a guitar. Frank Ford, the luthier who runs the site, includes pictures and anecdotes and includes instructions for making a shipping box. There are a variety of special cases available for guitars. Here’s some to consider. Case cover. A case cover goes over your hard shell case. It protects your case from scratches, abrasions and other minor damage. You can replace it when it wears out while your main protection for your instrument (the case) is still in good shape. Scrapes and abrasions may not seem like much but consider that the handle, latches, locks and hinges on a guitar case can easily be damaged, even broken off. A case cover helps prevent those damages from happening and in the worst case, helps hold you case closed. Of course you really don’t need this if you’ve put your case in an outer shipping box. If you don’t use a case cover try putting duct tape over the hinges and latches to protect them. Flight case. One type of flight case is designed to hold your guitar in its hard shell case. In other words, it’s a commercial product designed to do the same thing the cardboard shipping box described above does. If you travel frequently with expensive guitars, this will probably be more convenient than a cardboard box and will look better as well – more professional looking. If you don’t travel often then do you need to spend more than $200 for something a free cardboard box can do just as well? The other type of flight case is a substitute for your normal guitar case. These are more likely to be for electric guitars than for hollow body or acoustic guitars. Arched cases. The best protection for your acoustic guitar is from hard shell cases with an arched body. The arch creates an extra strong area above the top of your guitar and is designed to protect your guitar from such incidents as someone sitting or stepping on the case or to deflect items being dropped onto the case. The best acoustic cases according to most people are from Carlton. Carlton cases are expensive but worth it to professionals who travel. High tech cases. There are an increasing number of high tech guitar cases to protect your guitar and perhaps reduce weight. Not all of these are right for airline travel but some are and all are interesting if you’re thinking about case options. BAM High Tech cases. These are light weight flight cases, available for many instruments in addition to guitars. Expensive, like Carlton cases. Carbon fiber or alternatives. Fort EPP Tric Cases. These cases are designed by Godin guitars for their acoustic Seagull guitar line. They are priced similarly to a standard hard shell case but may be hard to find unless you get one from a Godin dealer. They are made from material similar to the hard foam in bike helmets making them very light weight. Their website says the cases are available for all sizes of Seagull guitars but the last time I checked (about 4 years ago) there was only one size and you fit the case to your guitar with included accessories. Reunion Blues. Reunion blues are the Cadillac among gig bags. They are expensive as gig bags go, more than standard hard shell cases. The ones I’ve seen are very well made but I’m not sure I would take a soft case over a hard shell case for airline travel. Previous Post:How do I play that chord? Part 4: Books, charts and devices. Next Post:How do I play that chord? Part 5: Wrap up.